Every so often I am asked to explain the allure of antique cufflinks. What sparks the enthusiasm for these diminutive jewels from the past? What makes an attractive pair of cufflinks irresistible? In my experience three factors contribute to the appeal of antique cufflinks - Art, History and Adornment. Collectively, these three factors - Art, History and Adornment - can be referred to as the "AHA effect". Over the next several months I hope to discuss the factors that make up the AHA effect. 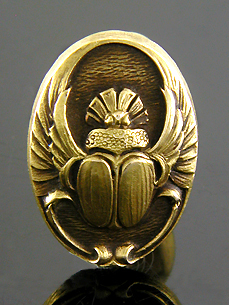 Today I will focus on the first factor ... the artistry of antique cufflinks. A colleague of mine describes and displays his antique cufflinks as miniature works of sculpture. He refers to this array of cuff jewels as "the sculpture garden." I am certain many cufflink collectors and admirers (myself included) feel the same way. 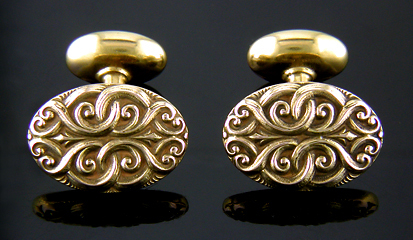 Intricate Scroll cufflinks in 14kt gold, circa 1900. What initially attracts me to a pair of cufflinks is the beauty of the design and artistry of the workmanship. Assessing period, materials, maker and other interesting details takes second place to just viewing and enjoying the cufflinks as miniature works of art. A few of the miniature masterpieces that we have had the pleasure of working with in the gallery illustrate this note. 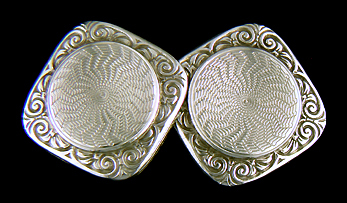 Jazzy spiral and scroll cufflinks, circa 1920. The artistic ferment of the late 19th and early 20th century gave rise to a profusion of artistic directions and philosophies. Each influenced jewelry and cufflink design. In the first half of the 20th century, cufflink styles ranged from the historic revivals and enthusiastic eclecticism of the Victorian era to the Art Deco and Moderne designs of the 1930s and 1940s. Examples also reflect the visions of Art Nouveau, Arts & Crafts and Edwardian jewelers who enjoyed periods of ascendancy. Striking Art Deco cufflinks, circa 1925. The great diversity of cufflinks from the past assures that there is always a pair to suit almost any taste . There is always something new to discover and delight in. After years of collecting and trading, I still come across unexpected designs and enjoy the excitement of examining a beautiful pair of vintage cufflinks for the first time. Carrington cufflinks anticipating the Op Art of the 1960s.